Kellogg's has left the market, but these four manufacturers stepped up. Kellogg's disappointed many people in the gluten-free community when it discontinued the gluten-free version of Kellogg's Rice Krispies cereal. 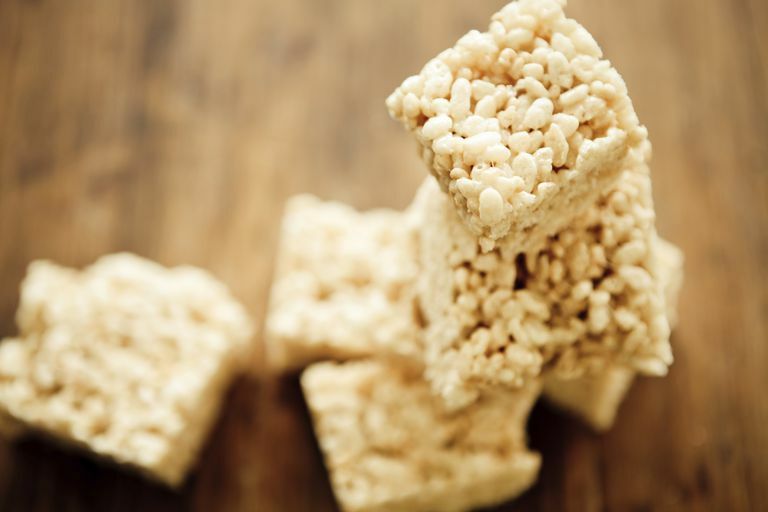 Not only did the public lose a perennial kid's favorite gluten-free cereal, but they also lost the primary ingredient for gluten-free Rice Krispies Treats. But don't despair—people with celiac disease or non-celiac gluten sensitivity have several "crispy rice" ​cereals ​that range from reasonably similar to nearly identical (and that will work perfectly well in the rice crispies treat recipe included below). Barbara's Organic Brown Rice Crisps: This brand, crafted from whole grain, non-GMO brown rice, is sweetened with organic fruit juice instead of sugar or high-fructose corn syrup. It may not work well for the most sensitive, however. It's manufactured in a shared facility that also processes wheat, soy, tree nuts, and peanuts, and some people can't risk any exposure. The cereal is tested to make sure it contains less than 20 parts per million of gluten. Erewhon Crispy Brown Rice Cereal: Erewhon's gluten-free cereal, manufactured by Attune Foods, contains just three ingredients: California-grown organic brown rice, organic brown rice syrup, and sea salt. It's certified gluten-free by the Gluten-Free Certification Organization (GFCO), which requires testing to below 10 parts per million of gluten. That's an important number to know depending on how much gluten can make you sick. Nature's Path Crispy Rice Cereal: This cereal (from the maker of perennial gluten-free kid cereal favorite Koala Crisp Cereal) also is certified gluten-free by the GFCO. It contains organic brown rice flour, organic evaporated cane juice, sea salt, and organic molasses. Nature's Path makes this cereal in a facility that also processes tree nuts, peanuts, and soy. Enjoy Life Perky's Crunchy Rice Cereal: This is listed last because it isn't an exact substitute for Kellogg's Gluten-Free Rice Krispies. The rice puffs are a bit larger and they're more round than rice-shaped. But Enjoy Life puts out a quality cereal product produced in a facility that's free of all major allergens, including gluten, and so it is worth a mention. Perky's Crunchy Rice Cereal is made with rice flour, rice bran, raisin juice concentrate, honey, and salt, and is certified gluten-free by the GFCO. This recipe works best with one of the first three gluten-free Rice Krispies alternatives listed above (Enjoy Life Crunchy Rice Cereal makes the treats crunchier than some people might prefer). These treats are super-easy to make. Just take your time on the stove, or you'll risk burning the marshmallows. Melt the butter (or non-dairy shortening) in a medium-sized saucepan over low heat. Slowly add the marshmallows and stir until the marshmallows melt completely and mix thoroughly with the butter/shortening. Be patient and keep the heat low, or you'll start to brown the liquid marshmallows. Remove the saucepan from the heat. Stir in the gluten-free rice crispies and keep stirring until all the cereal is coated. The mixture will be very sticky. Grease a 13-inch by 9-inch pan with butter or non-dairy shortening (use plenty, or the treats will stick). Using either a greased plastic spatula or wax paper, carefully press the mixture into the pan, pressing it out into the corners and leveling it. Allow the treats to cool completely, then cut into squares. To store uneaten treats, cover them with plastic wrap or wax paper. Old-fashioned wax paper works better since it doesn't stick. Which Marshmallow Brands Are Safe When You're Gluten-Free?